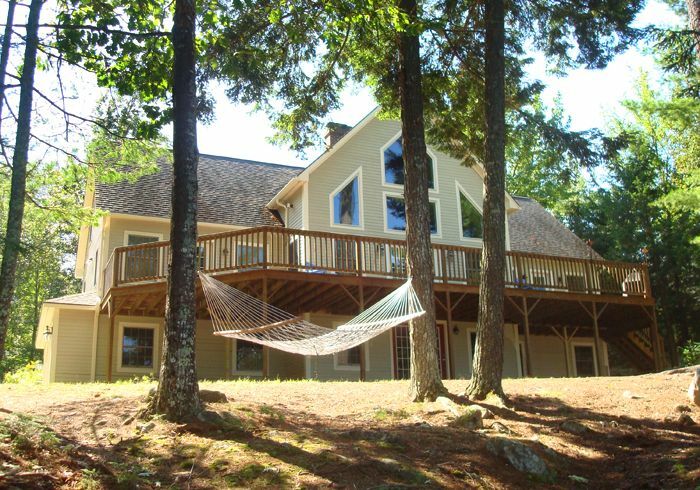 Gorgeous lakefront home with modern amenities and authentic Maine charm. The wrap-around deck overlooks the peaceful tranquility of the lake and a traditional fire pit near the lake shore. The main level includes a large gourmet kitchen with commercial style appliances. The home's wide open floor plan features cathedral ceilings, a large stone fireplace, ample table games, a TV lift cabinet upstairs, and a TV / family room downstairs. Like all homes in the area, the house has well water. The supply of water is adequate for normal, reasonable cleaning, cooking and bathing. Despite close proximity to the lake, excessive use of water may cause the well to run dry, resulting in the need for time to recover. Note: Dirtbikes, ATVs and off-road vehicles are strictly forbidden by the road association. All wheel drive vehicles are required during winter months. We loved our stay in this home! It was absolutely stunning! Unfortunately we were there for work and wished we could've had some time in to enjoy it more!! We will definetely be staying here again! Thank you for the hospitality!! This property had all that we needed for a long weekend in the winter. The house was well equipped for all our needs and the owners were easy to contact in case we needed anything during our stay. The house is clean and the location was perfect. I imagine it would be beautiful in the spring and summer as well. We definitely will be looking to stay here again. The house was great. Plenty of room and lots of bathrooms . Right on the lake. Grandkids had a ball in the snow. Only downside was the driveway which was snow covered and icy. We got stuck once, but managed to get out. We will be back in the warm months. The house and the experience was amazing! This is our groups annual New Years weekend together and always try to book a new house on a new lake to change things up. This house was one of our favorites! It had everything we needed and EVERYTHING was just perfect. We had a surprise engagement over the weekend as well which made it even more memorable. The lake was frozen and we were able to take some time to skate on the ice! It was amazing, we were able to skate last year and that was one of the best parts. One of our friends who left early had an issue on the icy hill getting out and Matt was so quick to get the road sanded and get her home safely! We loved every moment and every memory we made. Even as a group of adults, the hidden room was SO COOL. A few of us found it and decided to let the others discover it on their own. What a New Years weekend! Thank you Matt! We had a wonderful Thanksgiving week at this home. We were 6 adults and 4 children and had more than enough room for everyone. Wonderful kitchen with ample dishes and seating for the 10 of us. Plenty of space to spend time together or separate when needing some quiet. The children loved the secret room and it came in handy when we got snowed in and the temperatures dropped. A word of advice for anyone staying here when there is a possibility of snow or ice, a vehicle with 4WD or AWD is recommended. Our Jeep did great on the snowy, dirt road hills but the minivans did not. We used the Jeep to go out and get chains for the minivans and then they were able to get up the slippery hills. Beautiful views of the lake and when sitting outside, the quiet was complete. Crescent Lake is situated in the beautiful Sebago Lakes Region and this elegant, modern home is located on the desirable southern shore of the lake. This smaller, quieter lake is suitable for children of all ages. Enjoy all of your favorite freshwater activities, fishing, boating, water skiing, tubing, kayaking, etc. (rental comes with two kayaks and a canoe!). For the nature enthusiasts you may paddle or motor your way up the Tenney River where wildlife abounds. This river connects Crescent Lake to the larger Panther Pond. Close proximity to Freeport and Portland offers a multitude of shopping and dining experiences. The fall is our favorite time of the year on the lake; apple picking, hayrides, and nature walks. Located just a few miles away is Rattlesnake Mountain which offers great family hiking activities. In the winter months we are within easy driving distance to some great skiing including Shawnee Peak, Lost Valley and Sunday River. Snowmobiling, ice fishing, skating, and snowshoeing are all available at your front door, and all the attractions of Portland are only 30 minutes away! All wheel drive vehicles are required during winter months. Please call or email in advance of booking if planning to bring pets.